Ten years ago today I was sitting at home in North London, editing pictures from the previous day when London had celebrated winning the 2012 Olympics. I’d been at Eurostar’s Waterloo terminal where the company had thrown a party to await the announcement. As both Paris & London were in the running they couldn’t lose either way. It was a euphoric moment and the feelings of elation were still with me as I went through the pictures. I soon made the decision to grab my camera kit, jump on my bicycle & cycle into the centre to cover the story. What I saw that day shocked, saddened & also inspired me. With no tubes or buses running, London was eerily quiet – apart from the noise of helicopters & sirens. Many people had left work as offices had closed. Quite a few of them had made their way to pubs to watch the TV news, find out what the hell was happening & figure out how they were going to get home. The mood was sombre, but it was also defiant. I cycled between many of the sites & finally joined a group of journo’s who were gathered by the police cordon near Aldgate where we waited for updates from a police spokesperson. She had little to tell us. I decided to & see how people were managing to get home so I headed over to Fenchurch St station where I found thousands of people patiently queuing, waiting for their turn to get on a train & go home. There was no panic, no crying – just a sombre, defiant mood. That defiance is my overwhelming memory of that day & the days that followed. 52 people had been killed, London was bloody, but it was unbowed. It would not allow itself to be beaten. I’d always been proud to call London my home. That tragic day made me prouder still. Today (like so many people, Londoners and others) I will be remembering the people we lost that day – and also the living – who had their lives changed in such awful ways. 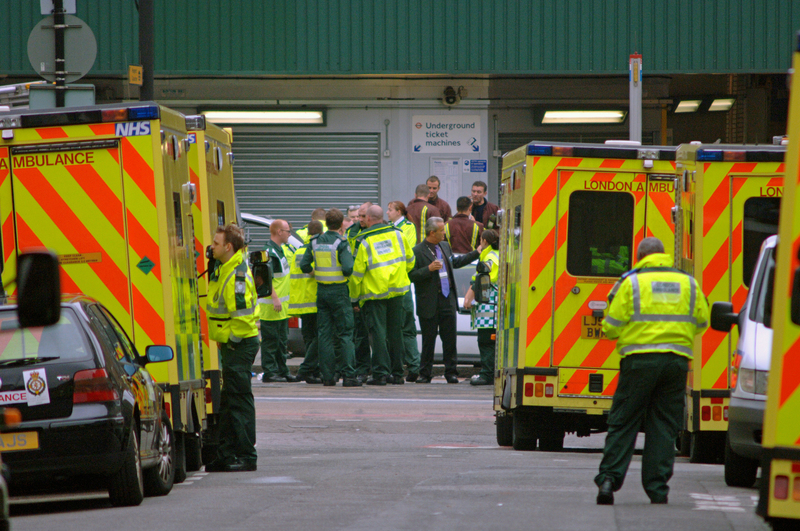 Kings Cross station was surrounded by ambulances,fire engines & members of the emergency services. With no tubes & buses running, people made their way home as best they could. 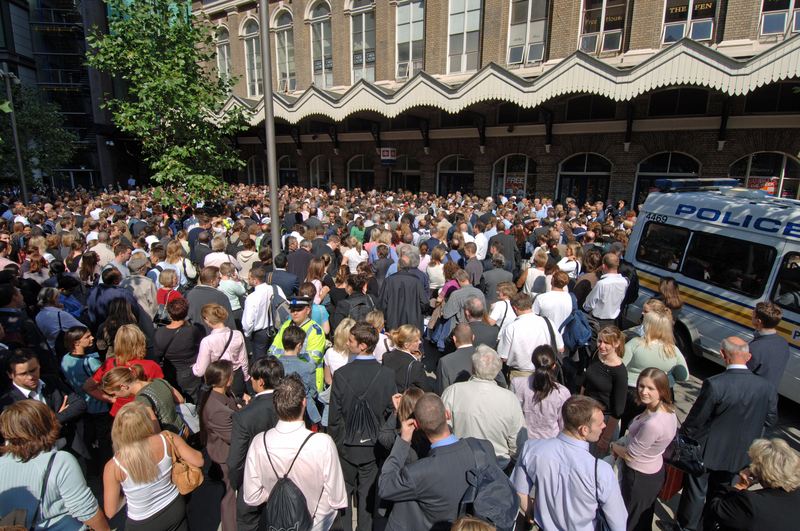 Thousands of people waited patiently outside Fenchurch St station. There was no fuss or panic, despite the obvious concern that such a crowd of people made an easy target. My website contains a gallery of pictures from that euphoric & tragic 24 hours. You can find it here.